Gummy Skeletons make the perfect Halloween Candy. 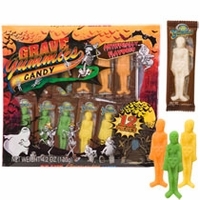 A fruit flavored gummy candy in the shape of a skeleton. Each pack has 12 gummy skeletons and are individually wrapped. These are perfect for handing out , using for your Halloween party favors or just to eat. We have all your favorite Halloween gummy candies. Gummy fangs, gummy brains, gummy earthworms and gummy eyeballs.